I first read about this product on http://www.peachandlily.com. After the initial “Ew… Snail slime? !” reaction, the description and promises intrigued me. Made of a whopping 92% snail secretion filtrate, this product promises to help with trouble marks (whatever that means), fine wrinkles, pore tightening, smooth skin, resilience and strengthen. (See below for Mizon’s product sheets.) All this from snail slime?! Sign me up! So after some searching on Amazon, eBay, Koreadepart, etc… I found this product for super cheap on Amazon, sold by TOKTOK (an American seller) and it only cost me $17! For the price, the quality of this product is really nice – comes in a dark, heavy glass bottle with a plastic scoop for hygienic purposes (which I promptly lost). The texture of the cream is nothing that I’ve ever felt before. At first kinda slimy and sticky, but it absorbs super quickly into the skin. There’s no smell at all – thankfully there’s no fragrance added like so many other Korean products. Even though it’s a cream, you’re supposed to use this before applying any ampoules or creams, almost like an essence. It’s very light, absorbs right into the skin and makes my skin plump and dewy right away. 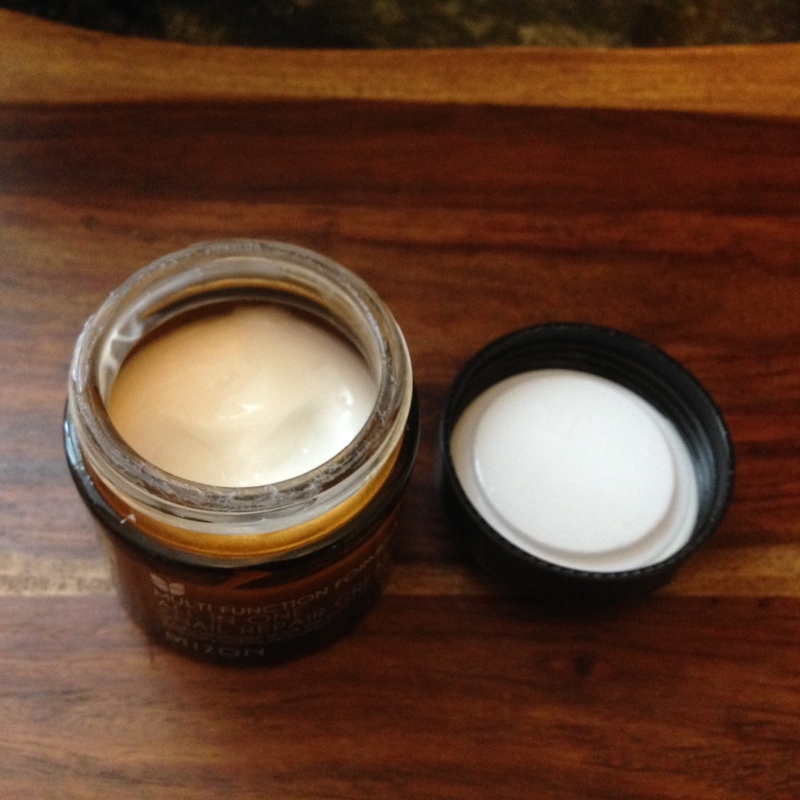 It’s not as moisturizing as I would like, but despite using the name “cream” it’s not meant to be the only moisturizer in your skincare regime. 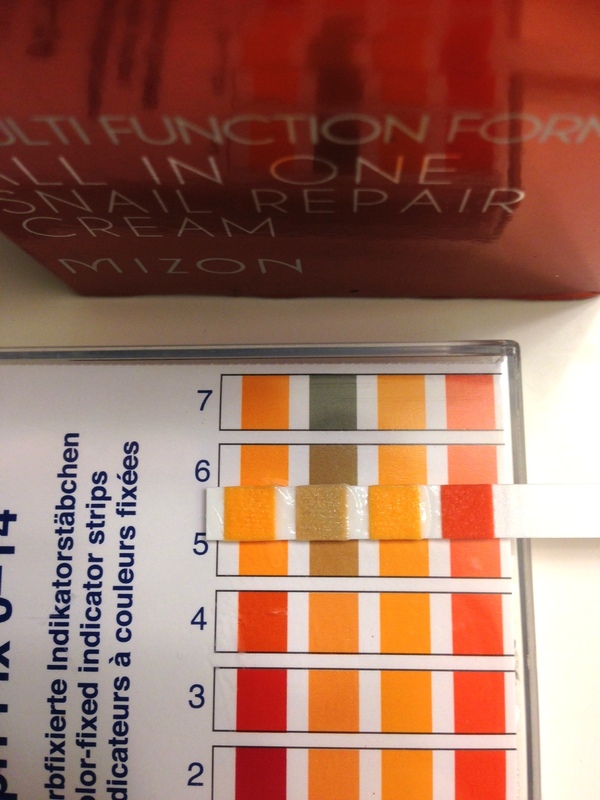 I tested the product, and the pH is set around 5.5. As you can see, snail extract is the #1 ingredient in this product, which is fantastic in my book! 92% of an active star ingredient is amazing, especially for how cheap this product is. Mizon also added some other great antioxidants and extracts that protect the skin and boost collagen. 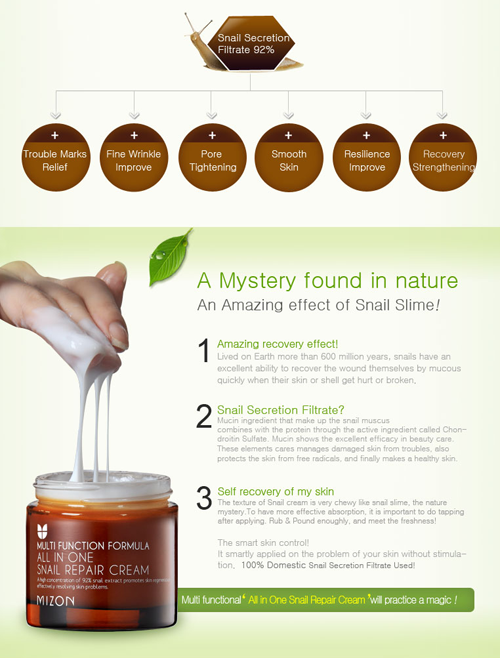 Snail secretion filtrate: AKA snail mucin, is what snail secretion is made out of. Through their mucus, snails have an amazing ability to recover themselves quickly when their skin or shell gets hurts or broken. 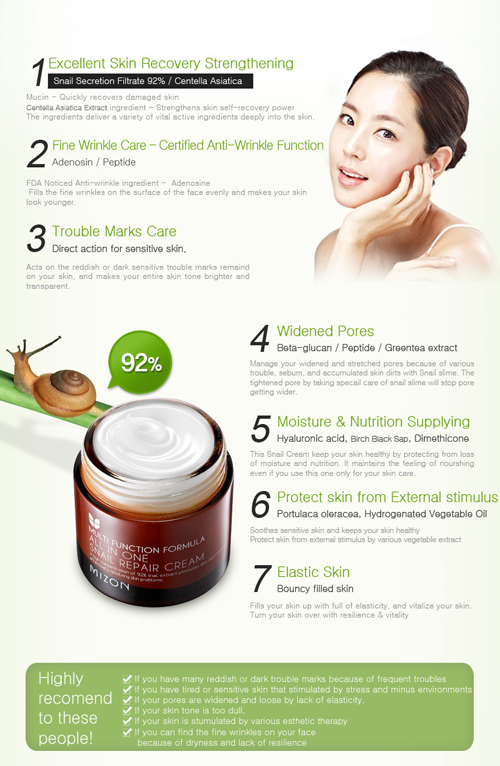 Snail mucin has an array of proteins and antioxidants, and it is also antimicrobial. On human skin, snail mucin has the ability to heal acne and other skin blemishes, tighten pores, smooth skin, improve fine wrinkles, and improve skin’s resilience. Adenosine: Penetrating deep into the skin, this ingredient is particularly good at helping reduce wrinkles and sagginess. It increases the production of elastin and collagen in the skin, and it also increases blood flow to the outer layers of the skin to repair damage to the skin. 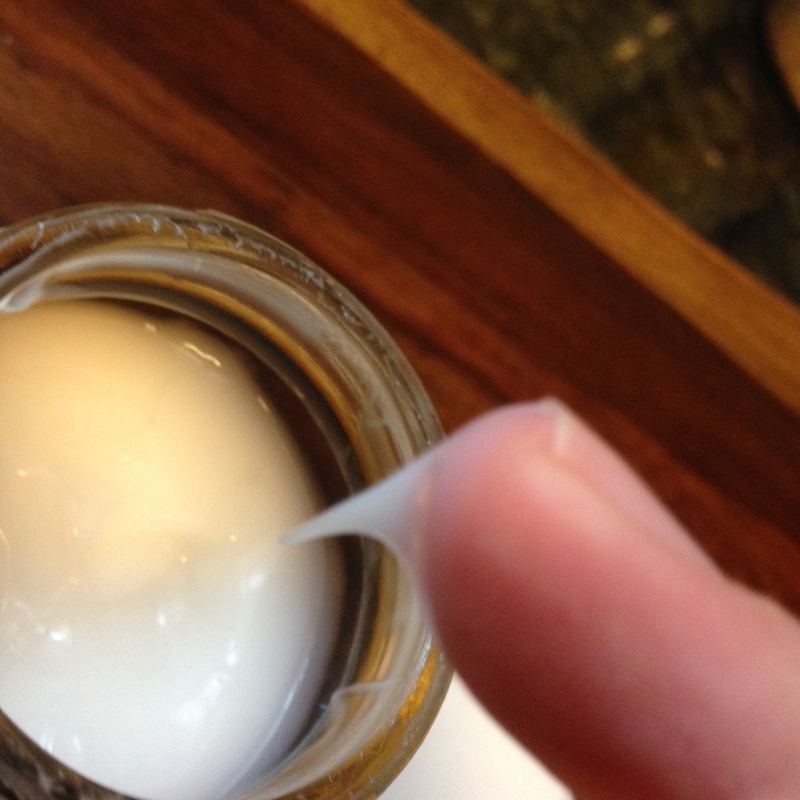 Sodium Hyaluronate: aka hyaluronic acid, is a very effective humectant moisturizer. It does a great job attracting and maintaining water in the skin, holding 1,000 times its weight in water. It also promotes blood circulation and nutrient absorption. BUT – there are a couple of fillers in here that made me really question whether or not I should buy it: according to http://www.cosdna.com, cetearyl alcohol, stearic acid, triethanolamine each rates a 2 for potential acne triggers, and hydrogenate vegetable oil rates a 3 as a potential acne trigger. But after I read more on http://www.peachandlily.com about how this product actually helped clear acne, I decided to take the plunge. And I am SO glad I did! I started seeing results from day 2 and I couldn’t believe my eyes. The rosacea on my cheeks was less red, the acne that I had started to disappear faster than normal. By the first week, I noticed that I didn’t have any of my normal white heads or little pimples that I get in between my periods. I will give an update on how my skin does during my period (which is usually when I get my hormonal cystic acne). But I’m hopeful that this product will help my skin during that time too! In the last couple days I’ve been dealing with a few cystic acne that came up while using a sample size of Paula’s Choice Skin Perfecting 2% BHA liquid. It’s a really good exfoliant (which I will write a full review of later) and I expected my skin to go through a purging period. Surprisingly, I didn’t get any little white heads or little zits, but I did breakout in 3 big cystic acne along the jawline. Normally, it takes about 1 week for any of my cystic acne to clear up, but mine cleared in 3 days, which I’m convinced is because of the snail cream that I’ve been using! So far the cream has lived up to most of its promises – it’s definitely helped with my acne, my skin is overall smoother and less irritated, and my skin definitely feels stronger! I wish I saw more tightening of my pores, but hopefully over time I’ll see some results in my pores too. I am in love with this cream! Snail extract has definitely made a visible difference in the condition of my skin and I am so excited to see how my skin improves in the long run! 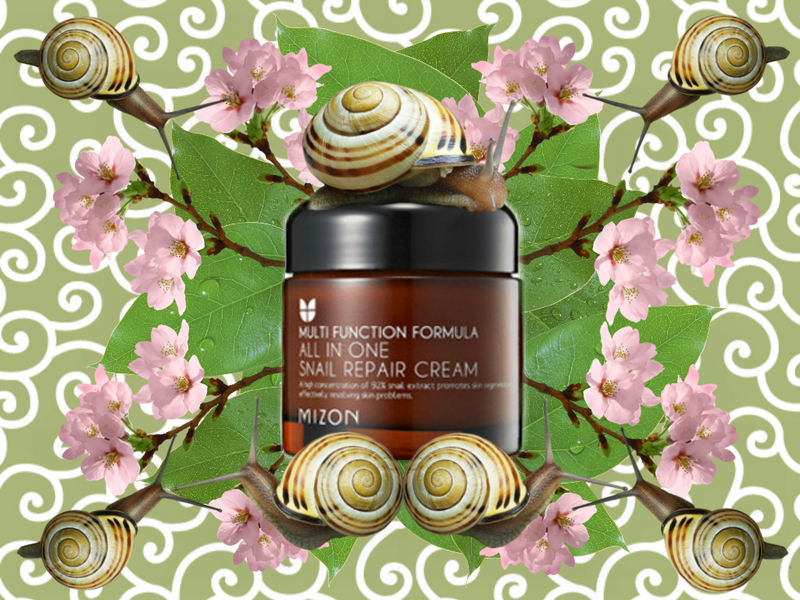 However, because of the multiple acne-triggering ingredients in this cream, when I’m finished with this tub I think I will try Mizon’s Snail Repair Intensive Ampoule, which has much less irritating ingredients in it. BUT if I don’t see similar results from the ampoule, I’m coming back to this cream, acne-triggers be damned! Pros: 92% of its *star* ingredient, soothing, some hydration, no fragrance, almost immediate improvement in skin condition, lived up to most of its promises! Hi! Well, in my post, I do mention that it has a LOT of acne-triggering ingredients in this product which I normally stay away from. But because I got such amazing results from this product, I decided to keep using it. This product definitely targets my acne, and I’m sure it’s from the magic of the snail extract. That’s why I recommend it. But if you are allergic to cetearyl alcohol, I wouldn’t recommend you use this. There may be another snail extract-based product you can use without any fatty alcohols. Just try to aim for around 90% snail extract, that seems to be the magic number. Hi, thanks for giving me a clue about what kind of cream I can use. I’ve been searching for some review whose suffer the same as me,, rosacea, enlarged pore, oily, acne prone, red cheek, etc etc…*phew…I finally found your blog ! *got bookmarked !! 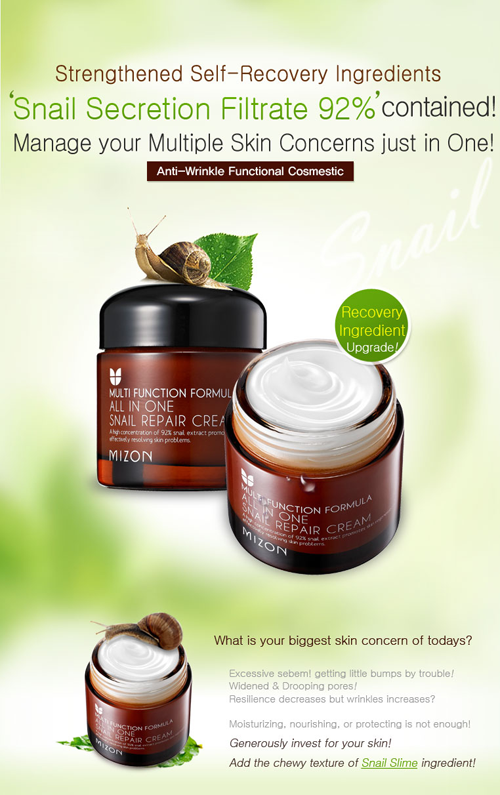 I’m gonna buy the sample of this mizon snail cream. I’ve been back and forth to buy this product. Well, since u enhance the quality of this product, I’m surely gonna buy it right away. Annddd..I’m gonna try the “Korean skincare routine” that u’ve suggested in your blog, since I’ve been choosing the fastest and easiest way, single cleansing, toner, moisturizer, never exfoliate or mask watsoever, then bye 😛 Well, I’ve made up my mind right now ! Oh, can you suggest me a good Korean brand for cleansing oil, Skinfood or Innisfree or something that you think ‘match’ with my/our face condition ?? For cleansing oil, I highly suggest Banila Co’s cleansing sherbet or Skinfood’s Black Sugar Cleansing oil (full review coming soon). Both are GREAT at gently cleansing waterproof eye liner and mascara, so I trust that it takes away all my foundation, too! Good luck, and hope you’re getting great results from the Korean products! Hi, just wanna tell you that i really enjoy reading your reviews in your blog. Helps me alot since im kinda new to kbeauty ^^ but i have question regarding this product..May i know is there any difference this product with the black version one? Thanks! I’ve actually never tried the black version. If I remember correctly, there were more hard moisturizers that I need to avoid for my skin. The ingredients are different from the brown one, though. Sorry, wish I could give you a better answer! I think this product does a good job of absorbing into the skin. Hi! Would you mind posting your whole skincare product line up, also like what order you apply them and if you have waiting times in between application? I have a similar skin type as you do and I am trying to get into the whole Korean skincare thing. However, I find the vast array of products to choose from so overwhelming. Thanks for the comment! You’ve actually inspired me on doing a post specifically about layering products… I can see how that’s a new thing that many people aren’t familiar with. Stay tuned! hello~ i caught up at your blog while reading about cosrx honey mask~ but then i read this mizon review. I wanted ask if i’m also using BHA with ph 4 (cosrx blackhead liquid) should i put it after or before the snail cream? Incredibly sorry for the late reply! Any exfoliators with a low pH (like BHA and AHAs) should be put on FIRST on a bare skin. And leave it for about 20 minutes for the product to work its magic before you add another layer of product and thus change the pH. Hello! 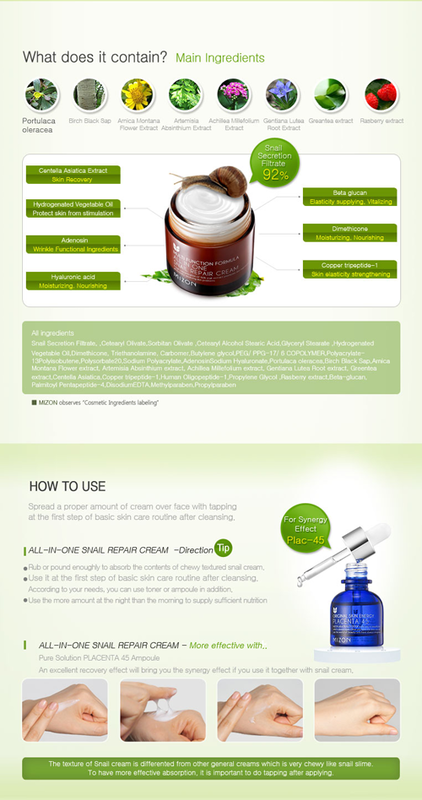 Could you tell me your skin routine with these two product: PC BHA 2% liquid and mizon all in one repair snail cream? Thank you! I put a little of the BHA on first, right after my nightly shower, and let it sit on my skin for about 20-30 minutes to properly exfoliate at the right pH. Then I add the snail cream or other moisturizers on after that!